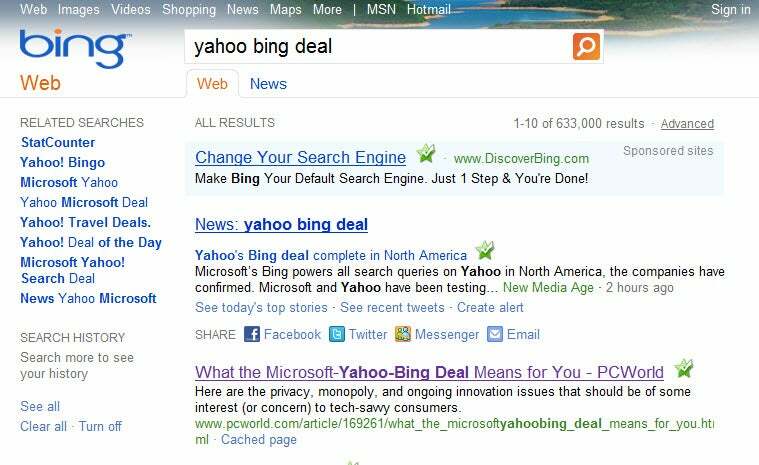 It's official: Yahoo's search results in the U.S. and Canada are now fully powered by Microsoft's Bing. The announcement came on Tuesday, a little more than a year after the two tech powerhouses agreed to combine search forces in order to compete with Google. And while many are lamenting the passing of Yahoo Search, one of the Internet's true originals, I'm not among them. Here are three reasons why I think Yahoo Search had to go. Yahoo was launched way back in 1994 as a human-powered search site. Forget spiders and search algorithms: Yahoo, in its first iteration, was basically a list of hand-picked Web links, organized into categories. You had to drill down through the categories in order to find the information you were looking for -- and you often found it complete with a written description of the site you were about to visit. The process was slow and while it was thorough -- for a time -- it quickly became apparent that trying to keep track of the explosion of Web sites was a job for which no mere mortal was equipped. A computer, or better yet, an army of computers, was needed instead. Yahoo tried to adapt, inking deals with Inktomi, Overture, and even Google, but the once-mighty site lost ground as more and more Web users went gaga for Google. In the years since, Yahoo has been unable to shed its old-fashioned image. People fondly recall Yahoo's days as a dominant search provider, but they do so while typing search queries into Google. Even if you combine their market share, Yahoo and Bing cannot truly rival Google's dominance of the search market. Google controls an estimated 66 percent of the search market, while Yahoo and Bing combined serve up approximately 28 percent of Web searches, according to numbers quoted by the Wall Street Journal. Still, working together gives Yahoo and Microsoft a stronger platform to rival Google -- and Google does need a rival. Microsoft, especially, should know a thing or two about how your products (ahem, Windows Vista, ahem) can suffer when you don't have a rival spurring you on to bigger and better things. Several commenters on Yahoo's Search blog have wondered why they should bother searching at Yahoo now that the site is delivering the same results as Bing. Why not, they ask, just head to Bing.com instead? I know one reason: the interface. Searching at Yahoo remains a markedly different experience than visiting Bing.com if only for the interface alone. And when I get my search results, I can take advantage of Yahoo's streamlined results page, and I can also enjoy my favorite Yahoo feature: the ability to filter out sources of content using the handy tabs that automatically appear on the left side of my search results. I also understand that some people prefer Bing's direct-to-search approach. Those users can head over to Bing.com and get almost the same search results without navigating through Yahoo's portal first. What do you think? 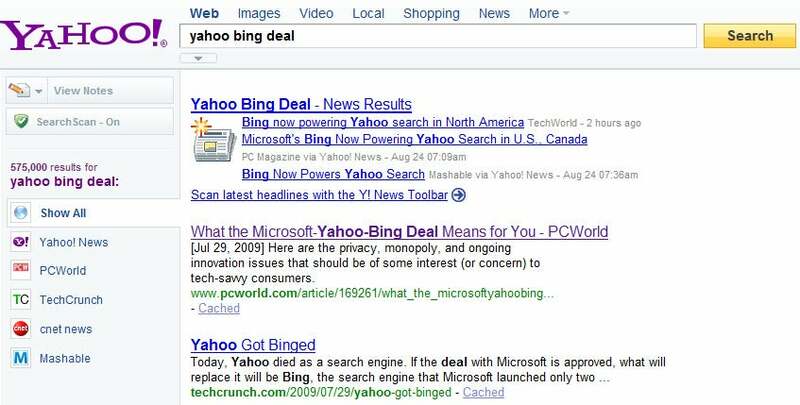 Is the Yahoo-Bing deal a good thing for the search market? Or is this a sign of the Internet apocalypse? Sound off in the comments.